Do We Really Honor the Declaration of Independence? Browse > Home / Public Policy / Do We Really Honor the Declaration of Independence? Progressively more every year, many Americans, especially public officials, demonstrate they need to review the reasons for Independence Day and why we celebrate the fourth of July. 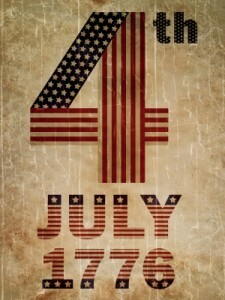 It is, of course, a national U.S. holiday that commemorates the adoption of our unique Declaration of Independence on July 4, 1776. Thomas Jefferson was inspired to write the historic document between June 11 and 28, 1776. He eloquently stated the convictions of Americans. They weren’t new ideals expressing the desire for liberty. John Locke and others beat him to it. However, too few Americans appreciate the risks of those 57 men who signed the Declaration of Independence – making freedom possible for all us. In the 21st century, the Fourth of July is a holiday of festivities and fireworks for Americans. The Declaration of Independence was written as a list of grievances against the King of England, and has been cited as a list of timeless principles. It was written and signed amid the American Revolution – the most significant event in our history. The first shots were fired in April, 1775. The war would last eight years. Coincidentally, the fourth of July has other significance. Two signers of the Declaration of Independence who were elected president, Mr. Jefferson and John Adams, passed away on July 4, 1826 — the 50th anniversary of Independence Day. Fifth President James Monroe died July 4, 1831. Thirtieth President Calvin Coolidge was born July 4, 1872. For most Americans, it’s a fun holiday. Across the nation are barbecues, baseball games, carnivals, ceremonies, concerts, fairs, family reunions, fireworks and political speeches. The holiday is a heavy travel weekend for many Americans. Allegedly, as a document, the Declaration of Independence is still cherished as an avowal of freedom from tyranny. Do we honor it? Are we truly independent? No. Those type of events challenging royalty more than two hundred years ago – catalysts for the American Revolution and the Declaration of Independence – are prevalent today. On a personal note, July marks the anniversary of this portal with business-coaching columns in 10 categories. Seeming countless assaults on the economic and political liberties of businesspeople prompted dozens of public policy columns. In recent years, conditions have worsened. Numerous crises are looming again this Independence Day. They include terrorism, the ObamaCare debacle, trade deficit, high under-employment from a weak labor-participation ration and an enormous $20-trillion national debt. At the very least, they threaten to financially imprison our children and grandchildren for decades. This also means they threaten this nation’s future. Much is prompted by dysfunctional public policies by the “ruling class” – that’s how one of this portal’s frequent readers describes many public servants at the local, state and federal levels. I ageee. He laments we keep electing the same people with the same damaging political, and in many cases, self-serving philosophies. Indeed, the situation is bleak for governments – from cities to federal – are dangerously in debt. Much of the debt is from obscene government pensions and salaries. Meantime, also for purely political reasons, there’s little statesman-like behavior in budget-deficit talks. Countless published reports indicate Democrats oppose every effort by the Trump Administration to grow the economy and to end fiscal waste. But Democrats aren’t alone in this regard. Republicans were responsible for countless earmark and pork legislation during the Bush Administration. President George Bush failed to veto even one bill with pork Republican earmarks during his first six years in office. On another front, the Federal Register has a compilation of all federal business rules and regulations adopted by the Obama Administration. A 2010 check revealed it contained 81,405 pages of regulations. Actually, the abuses of our liberties comprise a much longer list than discussed here. President Trump has been under fire by Democrats over his campaign to reverse them. Certainly, businesspeople from Bernard Madoff to Enron executives have let us down. But there are a lot hardworking, diligent business folks. Strangely, leftwing politicians wonder why such businesspeople feel shackled. When are we going to affirm the Declaration of Independence with economic patriotism to validate the principles of Independence Day? From the Coach’s Corner, actually, all of this fiscal chaos from disingenuous behavior suggests the U.S. Constitution is under fire, too. It’s worth reading.